And I often think the first line could be re-tooled to read: "Instructions for writing a food blog." After all, cooking is about paying attention. It's about orchestrating details, discovering techniques, and really becoming engrossed in the process of bringing something new and delicious into the world. And if there's no element of wonder, surprise, and astonishment about the process... then why would we bother? We shouldn't. It's the miracle of creating something new -- and then sharing it with others that makes food blogging so spectacular. It's also what makes life worth living. 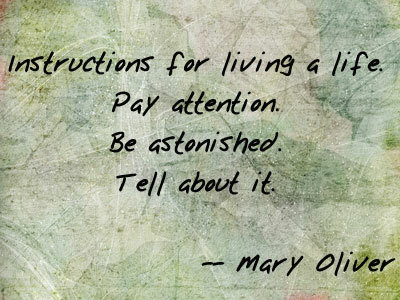 So, this year, we pledge to make Mary Oliver's words our motto. May we pay more attention to what matters. May we be heartily astonished by what we find. And may we eagerly share our discoveries with others. My instructions for writing a blog are even simpler. Write what you feel like writing. Ignore what everyone else tells you to do. Write your blog for no one but yourself. HOpe you guys have a great and tasty new year! You're not wrong, Rachel. You have to write what you feel like writing for it to be worth anything in the world :) And no one can tell you how to do it. Hope you had a wonderful holiday. Here's to all good things in the New Year!